Steam tells me I’ve played the game 27 hours since then and am 3 achievements away from maxing it out, and I’ve even convinced other people to play it, which has subjected me to some aggressive texts along the lines of “What is wrong with you? !” and “Why do you hate me I thought we were friends.” I don’t know what repeatedly draws me back to such an unhappy experience, what calls me to long for the game’s primary emotion, which is “Stop.” In his book “Killing is Harmless,” Brendan Keogh highlights the stop sign at the very beginning of the game, an easily-ignored warning about the best course of action to avoid the 8-10 hours of misery ahead. But you don’t stop, of course–you paid for it, you want to see what happens–and of course the developers don’t expect you to. In that way, the guilt the game tries to put on you can feel a little unfair; it’s a bit cheap, after all, for the game to force you into doing something and then chastise you for doing it. It’s far from a perfect game: the mechanics are a bit wobbly (though I think this is on purpose); the racism and sexism of other games are certainly still present; and even some of the more clever plot twists and narrative theories and non-binary binary choice moments (one of the game’s most brilliant features, in my opinion) fail to hold water under rigorous investigation. But despite these flaws, it’s a game that stands out my gaming history as brilliant, important, an experience I survived rather than a game I played, and one I constantly circle around, both longing and afraid to play it again. 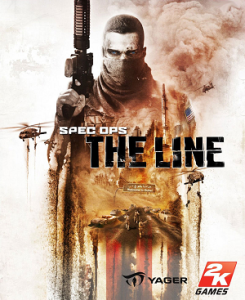 To me, Spec Ops is a game about games, and about shooter games in particular. Its design is so cliche as to laughable: the chest-high walls, the overtly-arranged cover, the turret scene in the mall, the carefully-placed sniper rifles across from people just standing around in snipe-able positions. It initially marketed itself as a boring old brown-and-yellow shooter, straight down to the box art, and I’m certain the punches it pulls are much more effective for Call of Duty fans who didn’t know what they were getting. It’s a game that asks me to think about why I game, about what I’m doing and how, if, and why I’m enjoying it, and maybe that’s what keeps calling me back. Because I am not enjoying it. I feel trapped in Walker’s Dubai, pushing against a game that doesn’t want me to play it, doesn’t want me to be here, constantly reminds me that I am the problem, the bad guy, the one who made everything go wrong. The difficulty swerves and spikes, keeping me off-guard. The landscape is disorienting; you’re constantly descending, but, as the Extra Credits video on the game points out, at some point there shouldn’t be any more down to go. Everything is strange and hard and glittering and decadently beautiful; I squeaked to the end in an exhausted slog with a flat, tight feeling in my chest, none of the usual victoriousness I feel when I manage to complete a shooter, which are far from my forte. I’ve played all of the endings, in one of which you are desperately outmanned and which took me several tries, all of which required me to decide, again, that what I wanted to do, no matter the odds, no matter my morals, was to kill everyone. When I managed to pull it off, I didn’t feel good. I felt the way the game always makes me feel: defeated, ugly, strange, sad. I love that feeling, though I don’t know why. I’ve never felt it in a game before. It’s a game that moves me powerfully, the way literature does, and a game that gives me hope for new ways that narrative and mechanics can work together for games to tell new stories, evoke new emotions, and give us new experiences. Ultimately I think it’s a game everybody needs to play, especially people who take games as seriously as I do. It says far more about what games are and who we are as gamers than it says about politics, which I can see as being a bit of a cop-out, especially given the politically-fraught nature of games of this genre, which so often feature white cis men with brown hair gunning down non-white people in droves. Held up to the aesthetics of AAA or the politics of indie games with less money riding on them, I can nod along to every complaint against it. But Spec Ops is one of those games I will forgive all its failings simply for the unique, powerful way it made me feel, for being the least fun game I’ve ever played that still remains one of my favorite things to experience, and for being a brave, risky piece of art in a medium so often unwilling to take risks. You will probably be mad at me for telling you to, but you should probably play it. I’ll be happy to buy you a drink after. You will probably need one.